Every employee knows that no matter how strongly you believe your boss is wrong, you simply can’t say certain things to him. However, that doesn’t mean your momma can’t do it on your behalf. After Jon Jones posted his fourth consecutive light heavyweight title defense, UFC president Dana White (Pictured) revealed he had finally settled his differences with his golden boy. Although, Jones’ mommy was a completely different story. “He and I sat down [Friday], we had a great conversation. 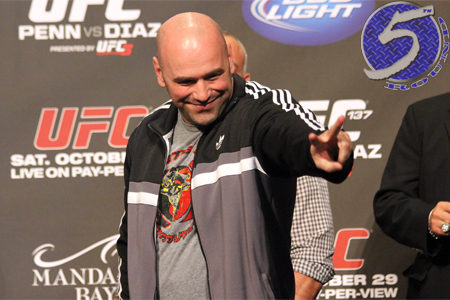 That went well,” White revealed at the UFC 152 post-fight press conference. “It was actually when Mrs. Jones got a hold of me – that was the problem. Her and I spoke [Saturday] evening and that was more unpleasant than the talk I had with Jon Jones yesterday. White kept both of his chats with the Joneses under lock and key. And while his comment about Mrs. Jones was tongue-in-cheek, you can believe Jon’s mom really did lay into her son’s superior for publicly lambasting her baby boy over the past month. Regarding the relationship that matters the most, White claimed he and Jon “shook hands as men and made a couple agreements” to ensure a long-lasting partnership. At 25 years of age, “Bones” is already arguably the most unstoppable force in mixed martial arts. So it was clearly a smart business move for both parties to squash their 29-day beef.